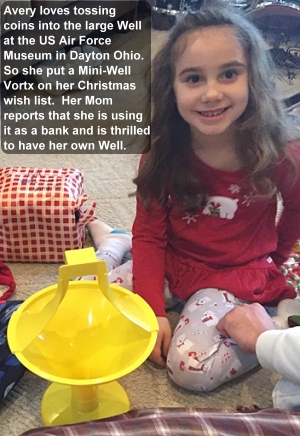 If your child has fun tossing coins into our large Spiral Wishing Wells that raise money for charity, he or she will have lots of fun with their own Mini-Well. Coins spin just as fast as in the large Wells. 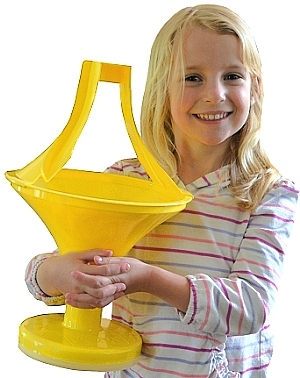 Your child can also play coin-spinning games and make the coins CLIMB BACK UP THE FUNNEL! You can see that in the video below, right. "The Vortx is the best toy for autistic children I have ever seen. My daughter is fascinated by the spinning coins and it is clearly her favorite toy. I like it because it gets her involved in the activity and helps develop her coordination and dexterity." Click here to read more information about the Vortx. by creating your own centrifugal force! Teach your children that it is better to give than to receive! Michael will never forget his 5th birthday. 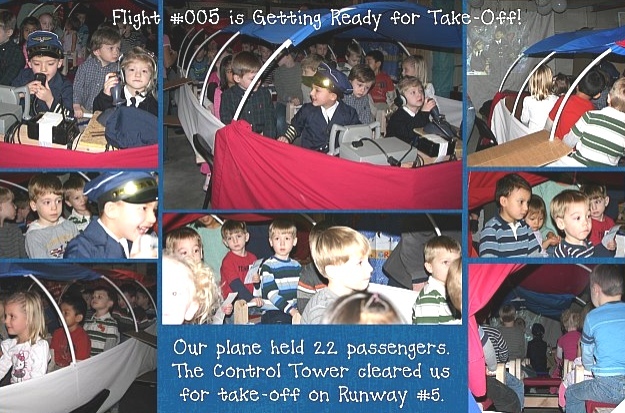 His mom planned a party theme like a travel adventure to Thailand complete with captain hats, security checks, a boarding area, tower chatter, customs and immigration processing, and surrounding props that would make Hollywood proud. 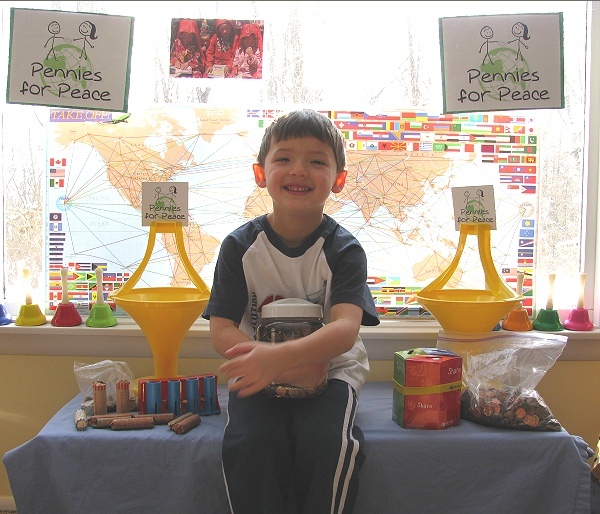 In lieu of gifts, his friends brought coins to put into two Vortx toy banks to raise money for, "Pennies for Peace" to help build schools and buy supplies for kids in Afghanistan and Pakistan. Mom Jennifer writes, "Thank you for the spiral wishing well toys. They were a big hit at the party. We ended up collecting $115.05 for the "Pennies for Peace" organization. A friend of mine is borrowing the toys this next weekend for her son's party for a different charity." After the party, Michael said, "I liked flying and having fun with my friends. I felt good donating all my pennies to help the kids build their schools." We think this is a wonderful trend. You might not create a masterpiece theme like Jen did, but you can teach your child a great lesson by making his or her birthday party a time to give to those less fortunate in lieu of normal gifts. We would love to feature your story and pictures too. Click here to read more about the"Amazing Birthday Charity Rally that raised almost $1,000 at a party."